If you are a teacher (or close to one), you will certainly agree if we say that teaching is a stressful job. However, even though the job is very demanding, we still find it absolutely fulfilling whenever we see some of our students excel inside the classroom. Laughter is indeed a great medicine. We have collected 21 funny teacher jokes, puns, and anecdotes based on everyday experiences and stories from both teachers and students that will help you get through the day. If you are feeling drained from the heavy task, all you need to do is to read some of these to chase the stress away. Q: What do you call a teacher without students? Q: Why did the teacher turn the lights on? A: Because her class was so dim. Teacher: Megan, why are you doing your multiplication on the floor? Megan: You said we had to do it without tables! 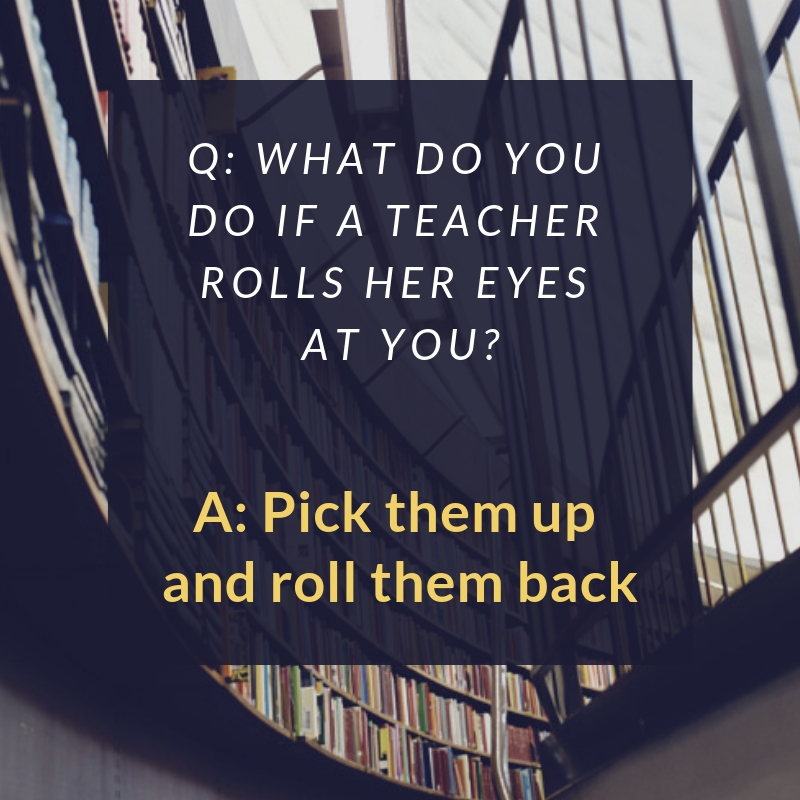 Q: What do you do if a teacher rolls her eyes at you? Q: What did the ghost teacher say to the class? A: Look at the board and I will go through it again. A first grade teacher handed out a coloring page to her students – on it was a picture of a frog holding an umbrella. Q: Teacher: What is the shortest month? A: Student: May, it only has three letters. Q: Why did the teacher wear sunglasses? A: Because his class was so bright! Q: Why were the teacher’s eyes crossed? Teacher: Why have you got cotton wool in your ears, do you have an infection? Pupil: Well you keep saying that things go in one ear and out the other so I am trying to keep them it all in! 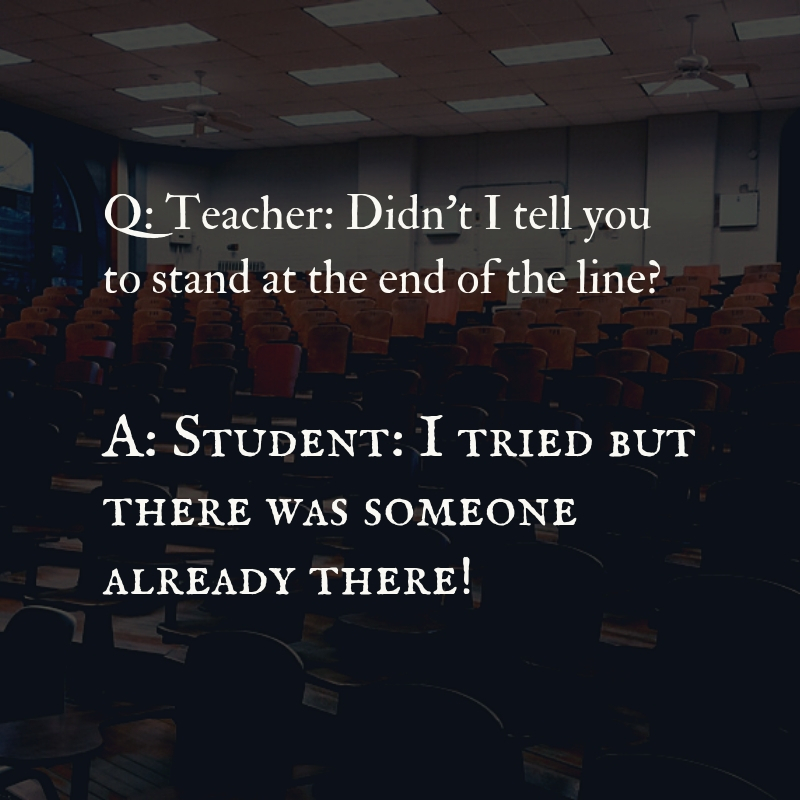 Q: Teacher: Didn’t I tell you to stand at the end of the line? A: Student: I tried but there was someone already there! Q: How is an English teacher like a judge? A: They both give out sentences. Pupil: Teacher, would you punish me for something I didn’t do? Pupil: Good, because I didn’t do my homework. Q: Why did the teacher go to the beach? A: To test the water. Q: Teacher: If you got $20 from 5 people, what do you get? A: Student: A new bike. Teacher: I want you to tell me the longest sentence you can think of. Q: Why did closing her eyes remind the teacher of her classroom? A: Because there were no pupils to see. Classroom experiences should not always be serious. As a matter of fact, you need to lighten up in order to bring out the best not only from yourself but also from your students. 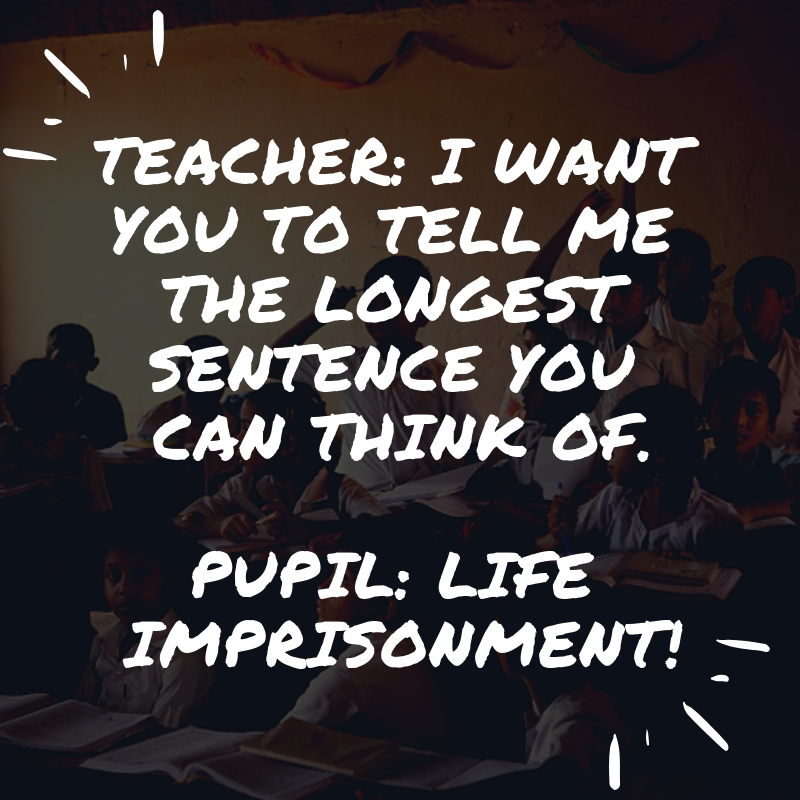 These 21 teacher jokes will definitely bring more fun to your otherwise tiresome job.